Could That Sippy Cup be Risky? In recent years, the sippy cup has become an integral pathway from bottle to regular drinking cup. A young child may spend a few years in this transitional stage during which most, if not all, liquid consumption comes from this convenient plasticware. This practice has been so common for so long that most parents don’t think twice about it. There may be good reason to, though. It is during the sippy cup years when a child’s mouth is in full developmental mode. The part of the product that fits into the mouth is typically made of hard plastic. The pressure and is placed on teeth and the jaw can inhibit healthy development of the oral structure in a similar way as thumb-sucking. This creates a risk for poor quality of sleep, speech and airway problems, and imbalanced facial proportions. 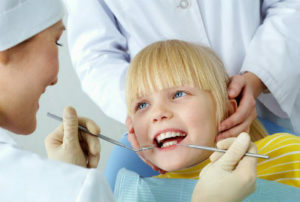 Cavity prevention is one of the major aspects of children’s dentistry. Children are naturally more prone to tooth decay because their body has not yet fully developed the ability to remineralize teeth faster than demineralization occurs. Drinking from a sippy cup could increase the risk of cavities even further. The reason some experts suggest children should not use sippy cups is because this habit allows prolonged sipping on beverages that contain sugar. Water is the only beverage that a child should drink from a bottle or sippy cup. Anything more and sugar residue is more likely to linger in the mouth long enough to invite bacteria to deposit acidic byproduct on growing teeth. Is it Time to Ditch the Sippy Cup? Understandably, the sippy cup meets the need for a transitional piece in between the bottle and regular cups – or so it seems. Interestingly, though, there also may be a built-in convenience aspect to this transition that has made us a little more reliant on this type of cup than need be. Many parents who bypass the sippy cup and go directly to a BPA-free hard resin cup for their growing children find that the new habit takes only a few days to learn. True, this means no sipping in the car; and no sipping at nap time, but children may be better off without those habits anyway. Parents can only do the best they can to support their children’s oral health. We are here to help with friendly children’s dentistry in Oak Grove, Warrensburg, and Windsor. To schedule a visit with us, call 660-747-9117.